We are a long established Family Business, beginning back in 1945. 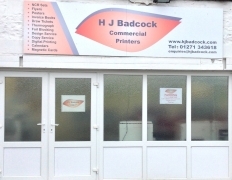 Originally started by Harold James Badcock after the Second World War, the business has been established in Barnstaple ever since. It is now run by his grandchildren Stephen and Michelle. You can still see the traditional style of printing performed alongside the up to date modern methods. We aim to offer a personal, friendly service, where we treat our customers as friends not clients. We are always happy to talk through any requirements you may have.